Search for all "HLA Class I ABC"
Rat anti Human HLA Class I ABC YTH862.2. Product is tested for Frozen Sections, Functional assay, Immunocytochemistry/Immunofluorescence, Immunoprecipitation, Flow Cytometry. PHA activated Human peripheral blood lymphocytes. 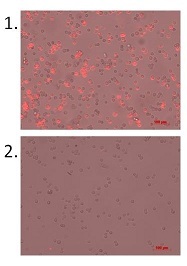 Spleen cells from immunised DA rats were fused with cells of the rat Y3 myeloma cell line. Functional Assays: Removal of Sodium Azide by dialysis is recommended prior to use. 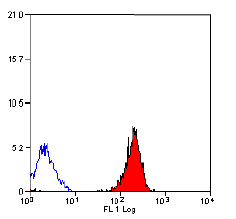 Flow Cytometry: Use 10 µl of 1/50-1/100 diluted antibody to label 106 cells in 100 µl. The major histocompatibility complex (MHC) is a cluster of genes that are important in the immune response to infections. In humans, this complex is referred to as the human leukocyte antigen (HLA) region. There are 3 major MHC class I proteins encoded by the HLA which are HLA A, HLA B and HLA C. These proteins are found on the surface of almost all nucleated somatic cells. 1. Genestier L, Paillot R, Bonnefoy-Berard N, Meffre G, Flacher M, Fèvre D, et al. Fas-independent apoptosis of activated T cells induced by antibodies to the HLA class I alpha1 domain. Blood. 1997 Nov 1;90(9):3629-39. PubMed PMID: 9345047. 2. Genestier L, Meffre G, Garrone P, Pin JJ, Liu YJ, Banchereau J, et al. Antibodies to HLA class I alpha1 domain trigger apoptosis of CD40-activated human B lymphocytes. Blood. 1997 Jul 15;90(2):726-35. PubMed PMID: 9226173. 3. Genestier L, Prigent AF, Paillot R, Quemeneur L, Durand I, Banchereau J, et al. Caspase-dependent ceramide production in Fas- and HLA class I-mediated peripheral T cell apoptosis. J Biol Chem. 1998 Feb 27;273(9):5060-6. PubMed PMID: 9478956. 4. Liu S, Tian Y, Chlenski A, Yang Q, Zage P, Salwen HR, et al. Cross-talk between Schwann cells and neuroblasts influences the biology of neuroblastoma xenografts. Am J Pathol. 2005 Mar;166(3):891-900. PubMed PMID: 15743800. 5. Schmidt J, Barthel K, Wrede A, Salajegheh M, Bähr M, Dalakas MC. Interrelation of inflammation and APP in sIBM: IL-1 beta induces accumulation of beta-amyloid in skeletal muscle. Brain. 2008 May;131(Pt 5):1228-40. doi: 10.1093/brain/awn053. Epub 2008 Apr 17. PubMed PMID: 18420712. 6. Muth IE, Barthel K, Bähr M, Dalakas MC, Schmidt J. Proinflammatory cell stress in sporadic inclusion body myositis muscle: overexpression of alphaB-crystallin is associated with amyloid precursor protein and accumulation of beta-amyloid. J Neurol Neurosurg Psychiatry. 2009 Dec;80(12):1344-9. doi: 10.1136/jnnp.2009.174276. Epub 2009 May 25. PubMed PMID: 19470495. 7. Schmidt J, Rakocevic G, Raju R, Dalakas MC. Upregulated inducible co-stimulator (ICOS) and ICOS-ligand in inclusion body myositis muscle: significance for CD8+ T cell cytotoxicity. Brain. 2004 May;127(Pt 5):1182-90. Epub 2004 Mar 26. PubMed PMID: 15047591. 9. Tanaka, J. et al. (2004) Cytolytic activity and regulatory functions of inhibitory NK cell receptor-expressing T cells expanded from granulocyte colony-stimulating factor-mobilized peripheral blood mononuclear cells. Blood. 104 (3): 768-74. This antibody recognizes a monomorphic determinant on the Human HLA Class I heavy chain. Epitope analysis has shown that this antibody binds in the alpha-1 domain. 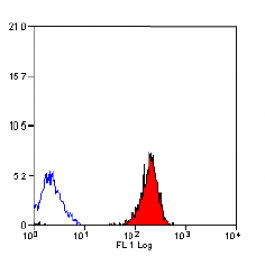 Antibody SM2012P detects the Human HLA class I ABC antigen without cross-reactivity to Mouse. Studies have shown that this antibody may be able to induce apoptosis in activated but not resting T cells (See Genestier, L. et al. for details).